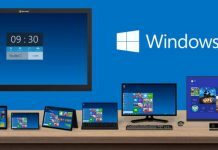 Windows 8.1 and eight operating systems were left out of the start menu feature, and they attracted world wide criticism. Instead of this menu, people were forced to open a large window to open their favorite applications. The start menu is back in Windows 10, and it is better than ever. It supports live tiles that get updated with an image or useful information when your system is connected to the Internet. The tiles can be grouped, named or resized. The Windows 10 start menu allows you to pin menu items to the taskbar. It supports various color codes. You can resize it or change the default black background color quickly. It displays recently or most used apps so that you don’t have to search for them. If you don’t want to see folders on your desktop, you can add them to the start menu quickly through the settings module of Windows 10 OS. With Microsoft Edge web browser, the user can bookmark his favorite website to the start menu. Although the new Windows 10 start menu is awesome, some people may not like it because it offers little customization options. Many people will search for software that will replace Windows default menu system with a simpler interface (as found in Windows 7, Vista or XP). Ivosoft Classic shell is the best available option when it comes to Windows 10 start menu replacement. This software gained enormous popularity when it was launched for Windows 8 and 8.1 OS. Ivosoft has launched the latest version of the classic shell for Windows 10 operating system. The newly released software has some improved features, and its is fully compatible with the latest Microsoft OS. Classic shell setup files are hosted on Mediafire, and they support seven languages that include Chinese, French, Russian, Polish, English, Italian and German. You can download installation file on your PC through the link I’ve shared in the last paragraph. When you install and run it, Classic shell displays a window in which you’ll have to select 1, 2 column or Windows 7 style start menu. If you don’t like the default Microsoft Windows logo in the menu, you can replace it with the preinstalled aero, classic logos or any image stored on your computer. The users are allowed to save their settings as a backup in XML file format. They can change the behavior of laptop’s trackpad/mouse. Users can configure hot keys to invoke the start menu. Classic Shell Windows 10 version is loaded with windows aero, classic, midnight, windows eight skins. You can configure it to disable or enable the user picture, glass color, white menus, etc. You can also enable small icons and large fonts through the same interface. Classic shell supports Windows 10 taskbar customization with which, you can make the taskbar opaque and transparent. You can also change its color. It allows you to set a sound for menu items, popup interface, commands, etc. Users are authorized to change the look and feel of the menu without tweaking the Windows registry. They can set the small/large icon sizes, animations, sorting algorithm, opacity, etc. When you hove the mouse cursor over any of the menu item, Classic Shell will replace the profile picture with the icon of the folder. Isn’t this a cool feature. The search tool is fast, and it will categorize the results in settings, documents, programs, etc. You can activate/disable its auto complete, keyword usage frequency, internet search module through the Classic shell settings utility. The menu item positions are fixed. You will not be able to move the icons when this software is active on your machine. CS has some unique features for the Internet Explorer browser. If you’re using this browser, you should use them. 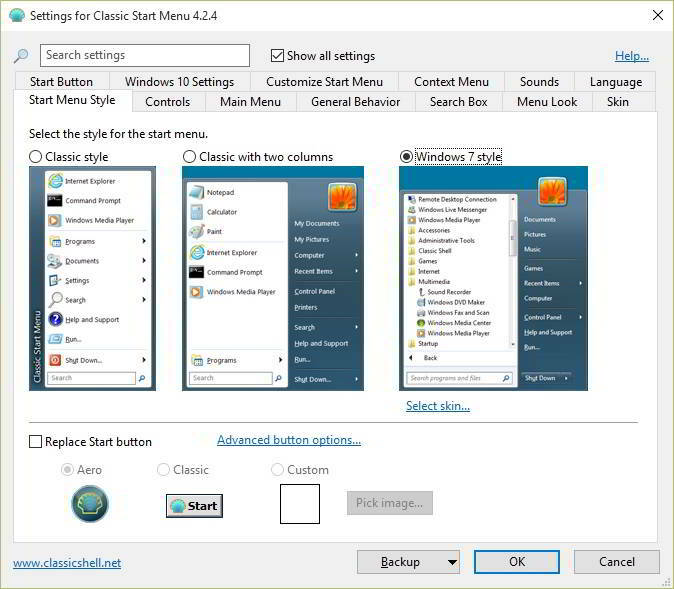 When you install classic shell, the default start menu of Windows will be immediately replaced, but you’ll be given an option to switch between the two interfaces. I’ve highlighted the same in the below screenshot. If you don’t like the replacement, and you want back the old Windows 10 menu system, right-click on the start button and choose the exit button. Because of its hidden advanced settings, Classic shell is the best application for the people who love tweaking the start menu of Windows OS. Try it out and you will love it (download this free software here). The performance of this application is excellent. It is fast and offers a lot of customization. You don’t have to edit registry entries to play with the menu system. yes! you’re right. CS is amazing. Love Classic Shell. Very customizable. I can’t stand the Windows menu nor do I need any tiles or advertising. I prefer desktop apps.